What is a (cloud app) performance signature? Andi Grabner works as the DevOps Activist (real job title, not joking) for software intelligence company Dynatrace. Activist eh? Why’s that Andi? “Because I want to activate people into becoming change agents and embrace DevOps,” said Grabner. Grabner’s comments were made at Dynatrace’s annual user conference Perform held this January in Las Vegas… he explains that his firm’s approach to cloud-centric cloud-based Application Performance Management (and allied layers of software intelligence) means that DevOps practitioners will be able to use Dynatrace technology to track what he calls application performance signatures. What is a performance signature? “After functional tests have been carried out [on an application] and unit tests have been carried out [and so on]… Dynatrace can show developers [by feeding information into a Continuous Integration (CI) Continuous Delivery (CD) engine such as Jenkins] how the actual performance signature of their application code has changed after updates have been carried out,” said Grabner. For Grabner, DevOps is all about getting the right [application performance] data to the right people [programmers and operations staff] at the right time in order for them to know what they need to do next. The performance signature itself lives next to the developer’s code in GitHub (or another repository) and is created to express the metrics upon which an app’s success should be measured. So, to explain the above statement in more colour, the performance signature is based on metrics that could be application speed, application resource consumption, end user experience… or some business use case Key Performance Indicator (KPI) such as an app’s ability to help convert sales and so on. 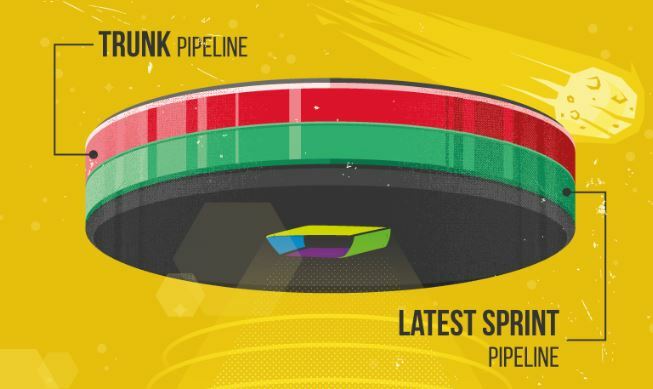 Dynatrace has developed a Pipeline State UFO to help express the state of an application performance signature and show the status of any single project. This IoT gadget can be used to alert the development team to problems if the commit code that impacts the performance signature. Your app has a performance signature… now you need what shape (and colour) it is.